Before you can deploy a Simple Certificate Enrollment Protocol settings profile, you must create a Trusted CA certificate profile. You will need to have one of each of these profiles for each tenant server and for each mobile device platform. 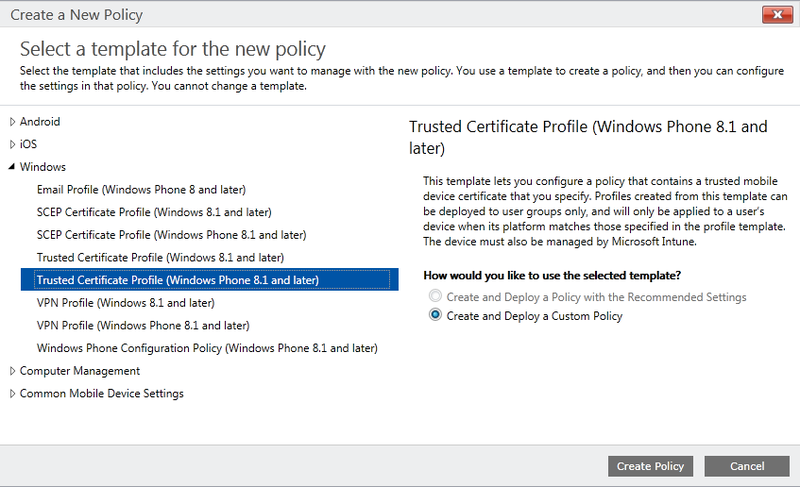 The policy templates for both Trusted Certificate Profile and SCEP Certificate profiles are available for Android 4 >, iOS 5 >, Windows 8.1 > and Windows Phone 8.1 >. Imported: take into account when defining SCEP Certificate Profile policies, the properties configured (key usage, validity period, size, hash-algorithm & extended key usage) corresponds with your NDES certificate template! Certificate file (Click Import to select the Root CA certificate). When you are finished, click Save Policy. You’ll be prompted to deploy the created Trusted CA certificate profile policy. 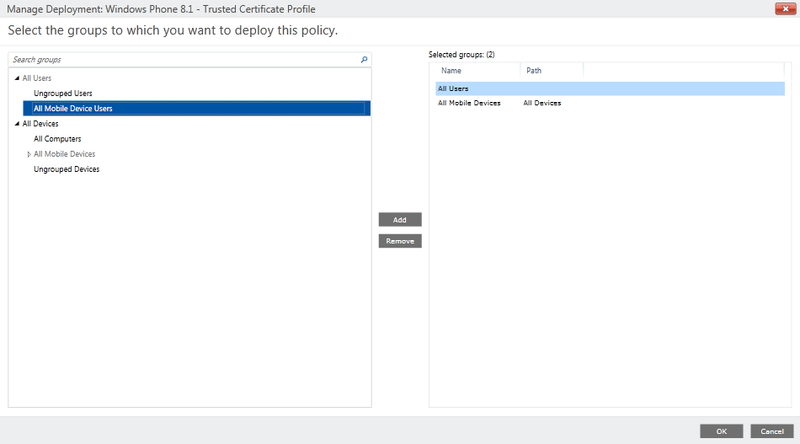 Deploy the Trusted CA certificate profile policy preferably to a user group (not a device group), as this will allow certificates to be published to the device very quickly after it is enrolled. After you have created a Trusted CA certificate profile, you can create SCEP certificate profiles to allow you to deploy certificates to mobile devices. 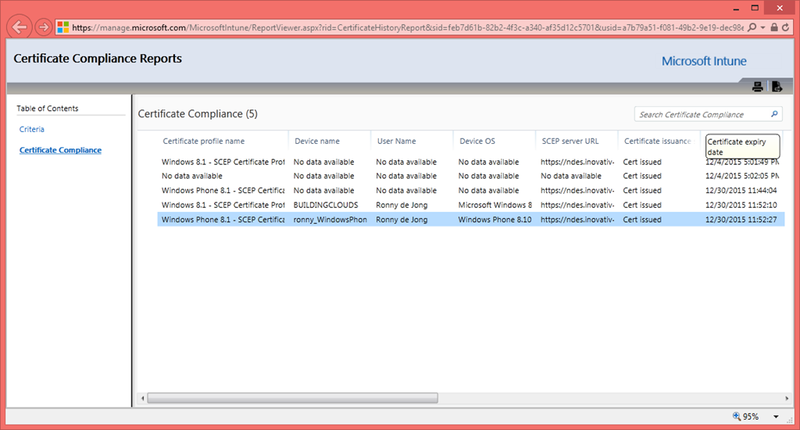 In the Microsoft Intune administration console, click Policy > Add Policy. Install to Trusted Platform Module (TPM) if present – Installs the key to the TPM. If the TPM is not present, the key will be installed to the storage provider for the software key. Install to Trusted Platform Module (TPM) otherwise fail – Installs the key to the TPM. If the TPM module is not present, the installation will fail. Install to Software Key Storage Provider – Installs the key to the storage provider for the software key. Key Encipherment Certificate can be used for encryption. Digital Signature – Data can be digitally signed by this certificate. Select Root Certificate. Click Select to choose a root CA certificate profile that you have previously configured and deployed to the user or device. This CA certificate must be the root certificate for the CA that will issue the certificate that you are configuring in this certificate profile. When you are finished, click Save Policy. You’ll be prompted to deploy the created SCEP certificate profile policy. 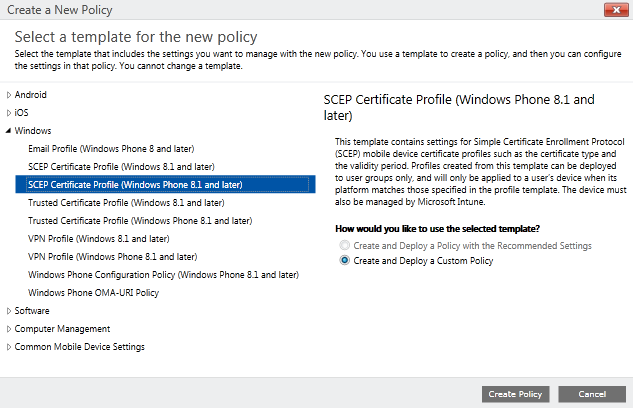 Deploy the SCEP Certificate profile policy preferably to a user group (not a device group), as this will allow certificates to be published to the device very quickly after it is enrolled. 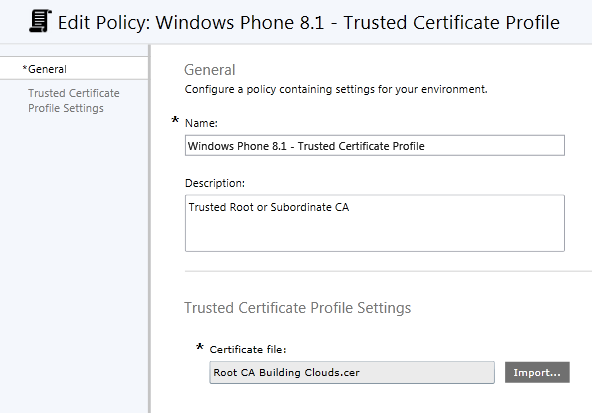 After refreshing my workplace policy on my Windows Phone device, both Trusted Certificate Profile and SCEP Certificate Profile policy came down to my device. The challenge response from my device is sent to the NDES server and being verified. 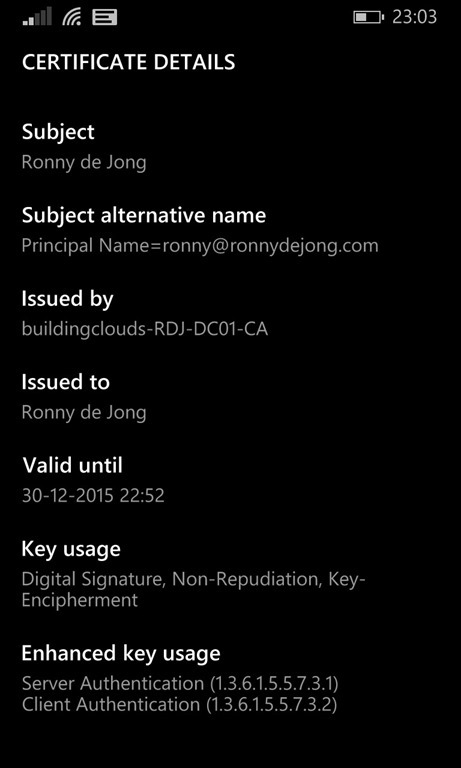 When the challenge response is ok, a certificate is generated by the certifcate authority and send to my Windows Phone. Using the Certificate Compliance Reports in Microsoft Intune provides you the possibility to monitor the status of issued certificates and there compliance status. 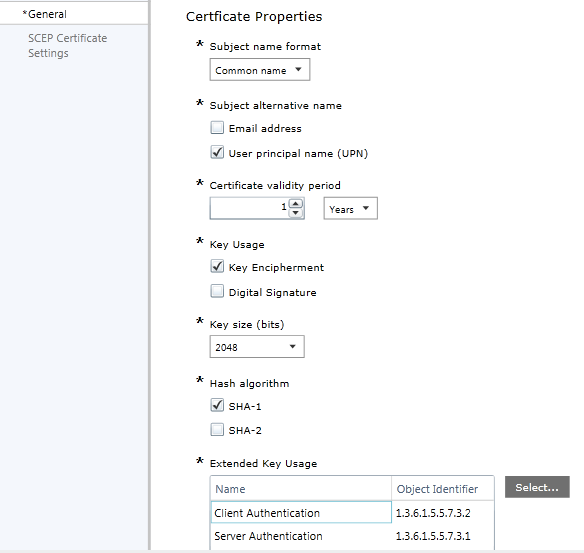 With this I have come to the end of 3rd blog post in the series of how to deploy certificates to mobile devices using Microsoft Intune NDES connector. In the last blog post I’ll cover the proces of throubleshooting the setup and configuration of the Microsoft Intune NDES Connector…probably the most interested one of this series. 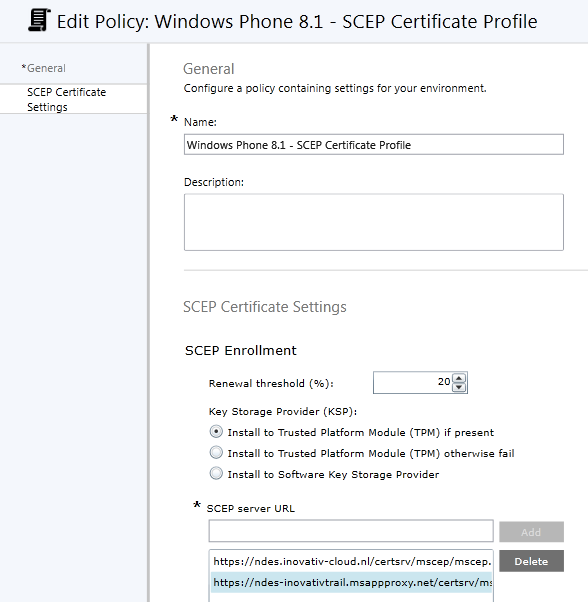 Unexpectedly SCEP certificate profile for windows 8.1 phone device is not deploying from Intune (24 + hrs) however trusted certificate profile has already applied on windows phone , Getting nothing in intune portal like error or when policy is not applicable or something like that . I have exactly the same issue did you get this resolved?